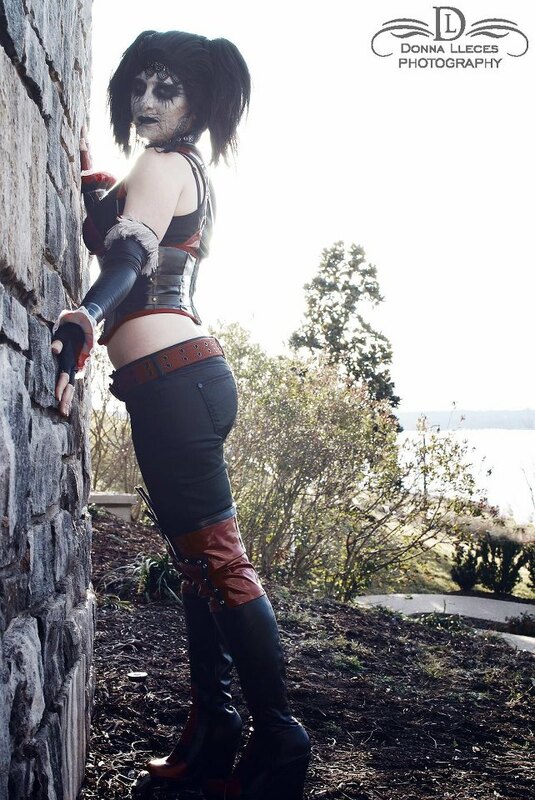 Today we have the wonderfully Talented Sistercacao Cosplay. She has put together a good assortment of characters. Andy: What was the first Convention you attended? Who or what made you go? What was your lasting impression of that Convention? Sistercacao Cosplay: My first convention was Otakon 2002. I had just gotten very into anime, thanks in part to some friends in school and also partly thanks to my cousin. I saw so many classics for the first time at that con: Ghost in the Shell and Akira are the two I remember most clearly. That convention had an enormous effect on me, as it was my first introduction to the otaku subculture in the US. I still love Otakon, I consider it my ‘home’ convention, and I look forward to it all year. Andy: You have such an interesting pseudonym, how did you come up with it? What is the significance of the name for you? Why do you personally keep your cosplay page separate from your real FaceBook page? Andy: Recently you cosplayed as Kiki, from Kiki’s Delivery Service, What is it about Kiki that you identify with? What is your favorite Miyazaki film? What is it about his style that you like? If you were a character in one of his films which would it be? SCC: I actually have a strange connection to Kiki’s Delivery Service, the movie. I used to be a teacher in Japan, and every day after classes, I would help the students clean the school grounds. They always played music over the intercoms during this time, and it was often the Kiki’s Delivery Service soundtrack. Whenever I hear the opening song, Yasashisa ni Tsutsumareta Nara, I am immediately taken back to that time and place, it’s very nostalgic for me. 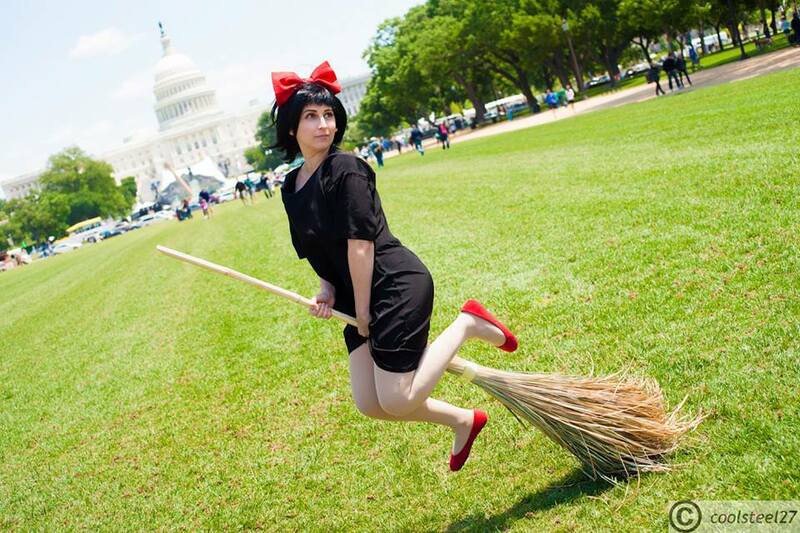 So when the Otakon organizers put out a call for volunteers to dress up as Ghibli characters for a special event at the Sachler and Freer Gallery in DC last year, I picked Kiki immediately. My favorite Miyazaki film is probably Spirited Away, but there are still quite a few I haven’t seen. I love Miyazaki’s commitment to hand-drawn animation, there is something timeless about animated movies done by hand, such as Spirited Away and Akira, as opposed to completely computer-drawn animation. It’s sad that it’s almost completely extinct in the industry nowadays. I guess I would pick Chihiro as the character I wanted to be, she is a really fantastic heroine, and is inspirational even being ten years old. Andy: What Anime besides Miyazaki did you grew up on? How has that shaped your cosplay choices? SCC: I grew up on pokemon and dragonball z, but if we had to go with anime that was formative, I would probably have to pick the ones I saw when I was in high school that really had an effect on me: Gundam Wing, YuYu Hakusho, FLCL, etc. However, most of my costumes have come from video games. I find my cosplay choices pretty disparate from the anime I watch, because I am drawn to very elaborate, striking designs, which usually come from games, especially fighting games. There have been a few games I picked up because I thought the characters looked cool, or I wanted to cosplay them, so I bought the game to see what they’re all about. Andy: Another one of your great cosplays is Cammy from the Street Fighter series, What made you want to cosplay as Cammy? What are your thoughts on the “thong” part in the back that is a part of her costume? Did you consider changing her costume for comfort sake? if no, Why not? If Cammy were to fight Sonya Blade, who would win? SCC: I am a fan of female villains, I find them much more interesting than heroines, so I usually end up cosplaying bad guys. I wanted to cosplay Cammy for awhile because I love Capcom character designs generally, and have cosplayed quite a few of them, but hadn’t tried someone as iconic as Cammy before. To me, cosplay is about 100% accuracy, as accurate as it is physically possible to get. I want to resemble the character as she would appear in real life, transferred from the screen. So no, I never consider changing costumes for comfort or modesty’s sake. If I’ve picked a costume to do, it’s because I’m comfortable with what it shows on the body. I wear Cammy with opaque dance tights on underneath, onto which I paint the camouflage designs. It may look like my bare skin in photographs, but I’m actually very covered. It’s partly for modesty but mostly because I think body paint doesn’t look as good for the camouflage designs, and I don’t want to spend upwards of an hour painting myself every time I want to wear this outfit. Cammy would win against Sonya Blade, because Street Fighter > Mortal Kombat, always. Andy: What fighting games do you play often? What games are you playing now? Xbox or Playstation? What are your thoughts on the Xbox One? SSC: I play Soul Calibur and Guilty Gear. I’m really, really excited for the new Guilty Gear to come out. Right now, though, the only game I’m playing a lot is Puzzle Fighter. It’s so, so addictive. I have only ever owned Sony systems! I am very loyal to the Playstation. I still have the original PS2 that I bought back in high school, and it still works perfectly. The only thing I wish it had was the kinect. I think the Xbox One is a terrible idea, but people will probably still buy it. I’ll wait for the PS4. Andy: You also made a very interesting nurse version of Harley Quinn, Where did you get the inspiration for that particular version of Harley Quinn? What is it about Harley Quinn that drew you to her character? Do you think she is a strong female or a weak one, to be in love with such a pyschopath? How in character, or zany, do you get when cosplaying as her? When on photo shoots, what kind of poses do you do with her that you wouldn’t do with other characters? SCC: That Harley Quinn design is from the Arkham Asylum game. I like the alternate color scheme it has, while still being very recognizably Harley. I really love Harley Quinn because she is so unbelievably screwed up. I grew up on Batman: the Animated Series, and she was always strangely my favorite character. She’s without a doubt a weak personality because she allowed herself to be brainwashed into this abusive relationship with the Joker. I won’t comment on whether she is a strong woman or not, because I think that’s a problematic question when it’s obvious the Joker is good at manipulating many people, male or female. I will say, however, that I don’t get the Joker + Harley obsession I see out there, there has never been a more unhealthy ‘relationship’, if you can even call it that, portrayed in a comic. It’s obvious in the animated series he doesn’t have any feelings for her, plus have we forgotten the part where he is physically abusive?? Andy: What is your next big costume you will be rolling out? SCC: I’m making Elysium from Soul Calibur for Otakon, so I will get to make giant wings for the first time, as well as an alternate figurine costume of Rei Ayanami, which is going to involve a lot of cool hardware and a modified plugsuit. SCC: My next conventions are Otakon, Dragoncon, and AUSA, which are back to back to back in August and September. Then, I’m going to New York Comic Con, for which I’ll probably make a new Harley Quinn costume :3 That may be all for 2013, I need a breather after all that!